This paper proposes two new metrics: ITUE (IT-power usage effectiveness), similar to PUE but “inside” the IT and TUE (total-power usage effectiveness), which combines the two for a total effi-ciency picture. Presentation on Save Energy Now, which is a national initiative operated by the Department of Energy's (DOE) Industrial Technologies Prograom (ITP). 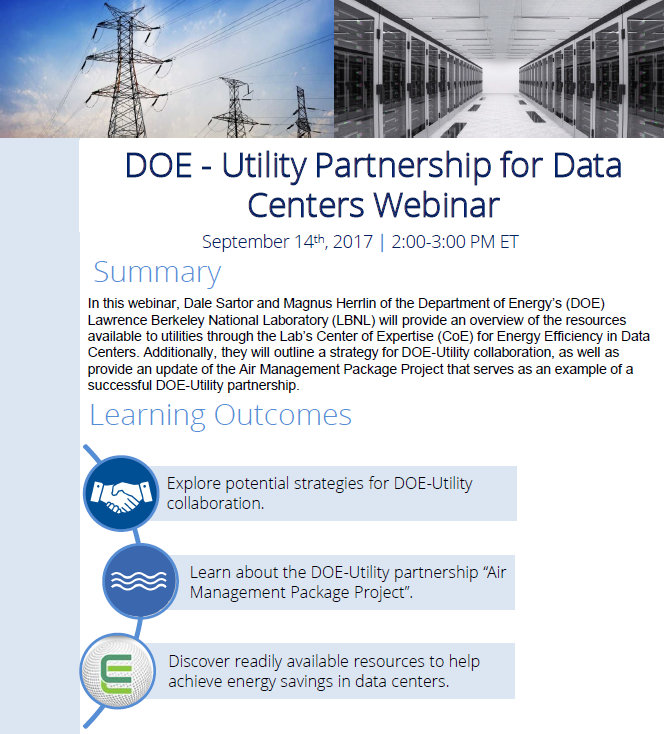 Slides from Arman Shehabi's webinar on the United States Data Center Energy Usage Report. Slides from Arman Shehabi covering the United States Data Center Energy Usage Report. Presentation was given at the Data Center Dynamics Webscale San Jose, California. USTelecom is the nation's leading trade association representing broadband service providers and suppliers. In May 2011, the American Society of Heating, Refrigeration, and Air conditioning Engineers (ASHRAE) published updated guidelines for the “Recommended” and “Allowable” temperature and humidity of data centers. This paper presents a suite of programs and services to help utilities capture the market opportunity of energy savings in data centers. Link to download white paper on the Water Usage Effectiveness (WUE) metric from Green Grid's website. Registration is required to download, but it's free to register. As data center energy densities, measured in power per square foot, increase, energy savings for cooling can be realized by applying wireless sensor network (WSN) technology and using the gathered information to efficiently manage the data center.